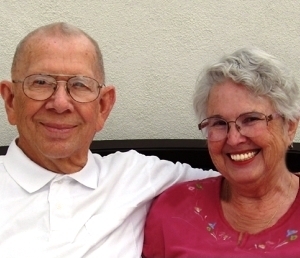 Jim and Helen Whitworth are caregiver survivors. While their individual journeys are somewhat different, their first hand experiences have set them on a mission to help both professionals and family members learn how to make this precious time more comforting and less stressful for both caregiver and their charges. Jim Whitworth, excerpt from live seminars.
" I tried to tell the doctors about symptoms that didn't match Alzheimer's and DID match what I'd researched about LBD but they said, 'Never heard of it!' and ignored me." Helen Whitworth, excerpt from her Award Winningblog, The Lewy Body Rollercoaster. "I learned that family care-giving is about so much more than the physical aspects. I became my loved one's connection to the rest of the world, their advocate with the medical community, and their main source of emotional support." Although Helen has a medical background, neither she nor Jim speaks with medical authority. Rather, they both bring you a well-informed caregiver's point of view. They have been through a myriad of physicians, care facilities, in home aid and alternative options. They have seen the good, the bad and the horrific ugly yet their research, trial and error and determination to create optimal care and comfort has provided them with effective tools they now share with other caregivers. As a nurse and educator, Helen dealt with patients with a variety of disorders and their family members. When her husband was diagnosed with cancer, she experienced care-giving from a family point of view. Soon after he passed away, she retired and spent a good part of the next five years as caregiver for three more family members (one at a time), including a sister with Parkinson's. In early 2003, Jim's first wife, Annie, died with Lewy Body Dementia (LBD). At the time, most people, including the medical community, knew very little about LBD. In their live seminars, Jim tells of the mounting frustrations that led to his determination to make increasing awareness about LBD, his mission. He was an early member of LBD online support groups and in late 2003, partnered with four other caregivers to co-found the Lewy Body Dementia Association (LBDA). As its first president, he helped the organization start growing towards its present highly recognized status. Jim and Helen were square dancers before care-giving took up their time. They decided to return to the sport at the same time and met at a square dance class. Once they were married, Jim's passion rubbed off on Helen and she became equally active in his mission. In 2007, Helen was voted LBDA Volunteer of the Year. "We have a great partnership. Jim has the mission and I have the writing and educational skills to move it forward. "… Helen Whitworth, excerpt from her webpage. The couple resides in an active 55+ community in Arizona, where they write, research and travel to speak at seminars. They have authored three books dedicated to caregivers. The first, "Riding a Rollercoaster With Lewy Body Dementia" was published in 2009 followed by the award winning, " A Caregivers Guide to Lewy Body Dementia " in 2010. 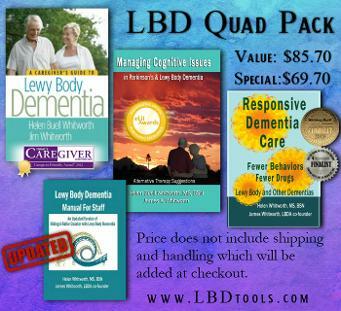 "Managing Cognitive Issues in Parkinson's & Lewy Body Dementia" was released June 2014. Jim and Helen have expanded their seminars and workshops to include protocol training for professional and family caregivers in effective alternative therapies and integrative medicine by experts in their respective fields. They have and will always make themselves available to speak to caregivers and are diligent in answering e-mails, letters and phone calls from the many they have met on this journey. To contact the Whitworth's, please click here. All books are written in the Whitworth's easy to read style, filled with well-supported facts and illustrated by personal examples. Get all four books written by The Whitworth's, two of the most knowledgeable laymen of Lewy Body Disorders (LBD). Their newest book, Responsive Dementia Care: Fewer Behaviors Fewer Drugs provides family and professional caregivers with tools for dealing with difficult dementia-related behaviors. Managing Cognitive Issues in Parkinson's & Lewy Body Dementia provides an overview of symptoms that can go into LBD and information on how to deal with them. A Caregiver's Guide to Lewy Body Dementia is the first caregiver-oriented book to provide a thorough picture of the disease. Riding a Roller Coaster with Lewy Body Dementia: A Manual for Staff makes a great gift for your home helper or care facility staff.